John Charles McQuaid was a voluminous correspondent. This book exposes the venom and charity of this prelate, whose correspondents ranged from Crumlin housewives to papal nuncios. John Charles McQuaid was a voluminous correspondent. However, through astute selection this book gives a flavor of the range of his activities in educational, health, ecclesiastical, political and international affairs. McQuaid thought like a demon, wrote like an angel and was meticulous in attending to every detail of his ministry as Archbishop of Dublin. 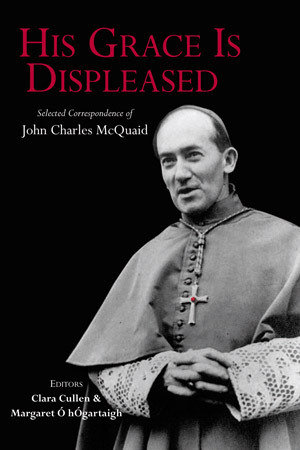 This book exposes the venom and charity of this prelate, who touched and tampered with the lives of so many both in Ireland and internationally. McQuaid, or ‘The Archbishop His Grace’, as he liked to be known, correspondents range from Crumlin housewives to papal nuncios. There was no aspect of the religious and social life of Catholic Ireland that escaped his eye and this legendary attention to detail is reflected in his illuminating correspondence. Clara Cullen is an Associate fellow, UCD Humanities Institute of Ireland, and is the editor with Orla Feely of The Building of the State: Science and Engineering with Government on Merrion Street (2011) and The World Upturning: Elsie Henry’s Irish Wartime Diaries (2012). Margaret Ó hÓgartaigh is currently based at Harvard University and is the author of Kathleen Lynn, Irishwoman, Patriot, Doctor (IAP); Business Archival Sources for the Local Historian; Edward Hay, Historian of 1798 and Quiet Revolutionaries: Irish Women in Education, Medicine and Sport, 1861–1964.